Enhance your shelf edge merchandising display by using acetal clips that will securely hold a double duty merchandising strip. 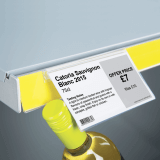 This is ideal for retailers who wish to increase sales by cleverly occupying extra shelf space with a clip strip display. 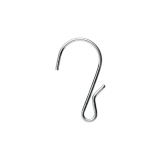 How will these strip clips fit my shelf? 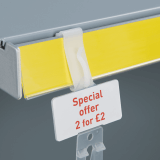 The White Acetal Shelf Edge Clips will fit a 39mm scanner rail shelf edge, or any shelf edge which has the channel at the front, as seen in many major supermarkets. 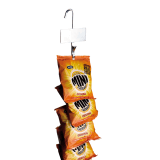 The shelf clips are supplied in packs of 100 (merchandising strips are supplied separately). How are the shelf clips made? Do you offer these scanner rail clips in other colours? 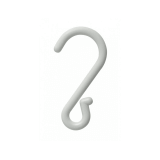 Yes, these Acetal Clips may be colour matched using the RAL or Pantone matching system.